The Three of Cups. Abundance. Bounty. Community. Friendship. Happiness. Surplus. The good things in life. The Three of Cups corresponds to the Sefirot of Binah, and so represents the passive, receiving side of the initial energy of the suit of Cups. 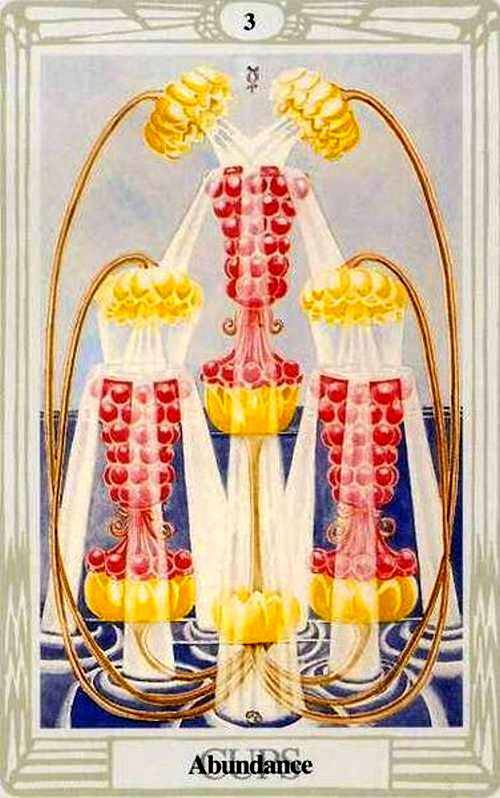 As the suit itself represents this same idea of passivity and reception, the Three of Cups reinforces and brings this quality in the suit to the fore. It represents the plane, and focuses on the positive emotions of intimacy and the fruits of passivity. The Three of Cups is where the energy of Cups figures out where it’s going, stabilizes, and begins to understand itself. Intimacy extended beyond two (which in terms of Cups, actually represents the singularity) become three of more (the binary of Cups), and this then becomes Friendship. Less powerful of a force (which is fiery) than love, friendship is a more passive relationship; intimacy with less of a drive. This ties in with ideas ofCommunity and Happiness as well; good friends make one happy. This idea is the next step of the energies expressed in the Two of Cups. The Three, however, goes on further to introduce the ideas of happiness in terms closer to the physical world, as corresponds to its relationship with the plane; it also represents Surplus, Bounty, and other “good things” in life. The card itself does not directly represent these things; it really represents the feeling of living a good life, having friends, community, and everything (and more) you need to be happy. This is really the card of happiness (the card of “joy” comes later). The Rider-Waite art shows three wreathed figures drinking and having a good time together, apparently dancing happily, while surrounded by good food; more than they would need. The Thoth art shows three cups in the shape of grapes (a common symbol of bounty), with flowers pouring water onto them; the reverse of what would be expected. This bounty (of water) comes from an unexpected source, and the cups themselves do little to achieve this bounty. In a reading, this card asks you to examine the role good friendships and communities play in your life, as well as your happiness with them and your surroundings. It also asks you how a surplus of what you need affects you, and indicates bounty. Reversed, this card serves as a more ominous warning; where does this bounty come from? Is it really benefiting you? Is perhaps some part of the duality of bounty – surplus and friendship – missing?